If you have already bought an aquarium or any other tank for keeping liquids but you haven’t yet bought fish, you may estimate the volume capacity of it by yourself. You can do it by filling the reservoir with the water up to the top edges of the reservoir. The amount of water in the reservoir is the volume of the reservoir. Then, with care, pour out all water in a separate reservoir. For instance, it could be a special reservoir of regular geometrical shape or measuring cylinder. You can visually specify the volume of your reservoir. However, if you need to take measurements of the water volume in the rectangular reservoir, it is more convenient to use our online app providing prompt and accurate measurements. Thus, the first definition of this free online app is aquarium volume calculator. When you select an aquarium or any other liquid tank, depending on the purpose, you have to pay your attention to a difference in total and filled volumes of the tank. The latter is more about the total capacity. The second definition of the app is aquarium capacity calculator, which means you can freely use it when you need to know the total volume of the water tank. This app is a nice tool not only for owners of aquariums and “goldfish”, but almost by anyone else. If one wants to know the fluid amount of a rectangular-shaped reservoir or tank, this is the right place. When you have to add some treatments or chemical additives, it is life-critical for the fish, if you use incorrect proportions. In this case, it is better even to re-estimate the volume of water, if you are not sure about it. Thus, the third aim and definition of the present app is aquarium water volume calculator. Additionally, it is possible to calculate any other rectangular tank volume. To use all the functions you should take measurements, enter figures into boxes and click ‘calculate’. 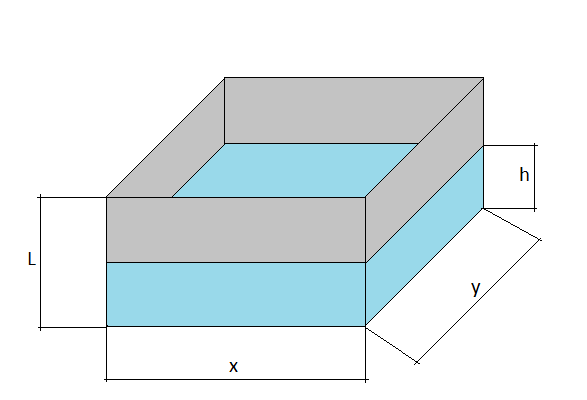 As it is said, the present app can calculate the volume of water in different rectangular reservoirs. It can be applied to make estimations of the reservoir surface square, total and filled volumes. Before you enter the parameters into the boxes and get the result, you have to use the gauging tape to dimension. X — Width of the reservoir. The aquarium litre capacity could be specified by a semi-easy, long and inconvenient way by filling the aquarium tank with water measure by one-litre jar until the water reaches the required limit. But know you now there is an easy way. In case you know the best what you would like, the app is also useful if you want to build an aquarium and specify the parts of the aquarium to be ordered. It is a trendy solution to set up an aquarium at home. It can occupy a notable place in the design of the room. Once you have decided to bring nature to your home by establishing a freshwater aquarium (or you might prefer a saltwater one, which is more troublesome in keeping), first you have to select an appropriate tank to keep fish healthy and feel happily. There is a large assortment of aquarium tanks at the market, so there will be no difficulty to choose one fitting the best your taste or any design of the room. There are tanks of round shape similar to a bowl or a ball, rectangular and square tanks, parallelepiped or pyramid like tanks. Beside the decorative function, the aquarium should provide the best solution in creating the optimal living conditions and environment for the fish you would like to have. The fish should feel freely and develop healthy. For that the tank should be enough spacious.